Last year she threw a curve ball. For the sixth dessert she convinced Milton, purveyor of the insanely delicious Le Gourmand cookies, to make a giant cast iron version. 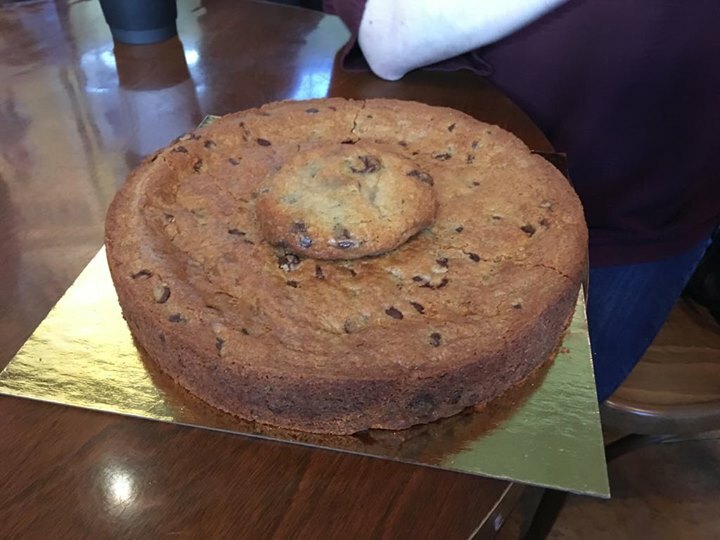 I’ve always wanted a food item on a menu named after me, and what would be more me than a gigantic ridiculous 6000+ calorie chocolate chip cookie? Roughly three weeks ago, my relentlessness paid off, and the man agreed to put it on sale. He’s already had a few people order the beast they all loved it. The cookie will debut publicly at some point this week, and here it is in all of its bestial glory (with a “regular” sized cookie on top for a size comparison). As such, after my flurry of #cookielife pics uploaded over the weekend, I think it’s time to retire the #cookielife. The charity food offs will continue. My love for cookies remains unabated. Giant chocolate bars will still be crafted. But with 200+ cookies and treats mailed to me in the past 20 months, and the debut of the SOL COOKIE (at a ridiculous 3.5lb), it’s the perfect high note to end on. And if you want the full story: #cookielife – how I convinced 200+ people to send me cookies and raised $50000+ for charity. Previous: Be the hubNext: Why is diet dogmatic?